1. A great capacity to hold essential oils. Because if an essential oil is not absorbed into the jewelry, then it is not a diffuser. It’s just jewelry. 2. The ability to release essential oils into the air. This means it allows the essential oil good exposure to the air so that it can slowly and continually evaporate into the air around the jewelry. If you have to uncork or uncap something and lift it to your nose to inhale essential oils, your experience will be more that of inhaling and less that of diffusing. It’s simple, right? Yet many pieces of jewelry marketed as “diffuser jewelry” don’t, in fact, diffuse essential oils because they fail to fulfill one or both of these two conditions. One more thing to consider: Though it’s fun to make your own diffuser jewelry you risk disappointment because craft clay baked in an oven or air dried will crumble and it will be fragile. Watch this short video to learn why professionally kiln-fired terracotta makes such perfect essential oil diffuser jewelry and see how quickly and completely terracotta clay absorbs essential oil. If you prefer to read about the benefits of terracotta as a diffuser, check out this article. When we began to make Terra Cotta Pendants in 2003, we did so because the only diffusers on the market were so expensive as to be cost-prohibitive. We believe everyone who loves essential oils should have a diffuser, and that it should be something that is effective, lightweight, hands-free, tuck-in-able and/or stackable (can be worn with other jewelry), affordable, sturdy (not fragile), with original designs professionally and lovingly made by hand. There was nothing like it on the market in 2003. So, as a family, we sought to change that. 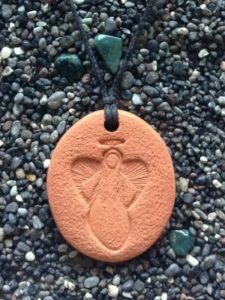 At Terra Cotta Pendants, we offer 89 different designs available in pendants or car diffusers and some in both, and discounts for bulk purchases along with free shipping when you buy 25 or more shipped to Canada or the US.